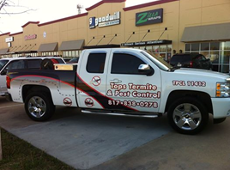 Texas Pest and Termite Control Services for Fort Worth, Weatherford, Azle and surrounding areas. 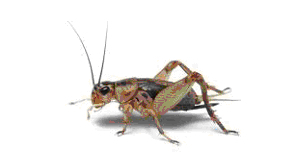 Pest Control for Fort Worth, Mansfield and surrounding metroplex. Tops Termite and Pest Control is reliable and affordable with the knowledge and proper care to extinguish any pest related concerns. 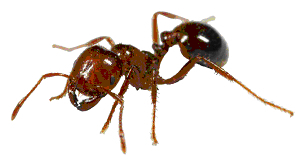 Fire ants are reddish and about 1/4-inch long. They nest in mounds of 1 to 2 feet in diameter and about 1/2-foot high. Large colonies can have up to 250,000 workers and at least 1 queen. Fire ants are very active and aggressive, they will sting an intruder repeatedly. Fire ants favor warm, sunny conditions. They prefer dry fields and avoid shady areas such as woods. Acrobat ants get their name from their habit of raising their abdomen above their head, especially when they are disturbed. When they are viewed from above, the abdomen is heart-shaped. Acrobat ants nest under stones, in stumps, in rotting logs, and under woodpiles. When they invade homes, they often nest in wall voids or in foam sheathing behind siding. Homeowners often find bits of foam around the outside of the home, next to the foundation. The ants also nest in wood that has been damaged by moisture and fungus. Argentine Ants vary from light to dark brown in color. These ants are about 1/10-inch long. 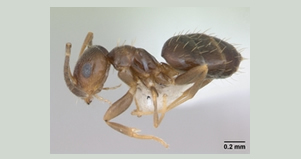 Argentine Ants are readily adaptable and can nest in a great variety of places. Colonies are massive and may contain hundreds of queens. Nests are usually located in moist soil, next to or under buildings, along sidewalks or beneath boards. These ants travel in trails, foraging day and night. They can eat almost anything but prefer sweet foods. 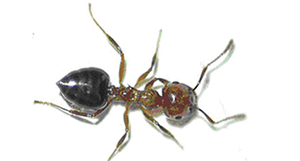 Odorous ants are dark reddish-brown to black and 1/10-inch long. Nests are found in a great variety of situations. Inside buildings, they are often found nesting in the walls or beneath the floor. They are most likely to invade buildings during rainy weather. They travel in trails, foraging day and night. The most distinguishable characteristic of odorous house ants is the smell of rotten coconut that is emitted when their bodies are crushed. 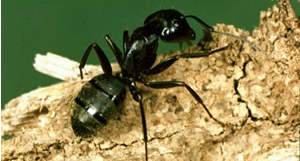 Carpenter Ants are among the largest ants, ranging from 1/4- to 3/8-inch long. The most common species is black, but some have reddish or yellowish coloration. Carpenter ants reside both outdoors and indoors in moist, decaying or hollow wood. Carpenter ants do not eat wood as termites do, but instead remove wood and deposit the debris outside of their nests in small piles. They cut "galleries" into the wood grain to provide passageways for movement from section to section of the nest. They can leave "sawdust" behind that provides clues to nesting location. 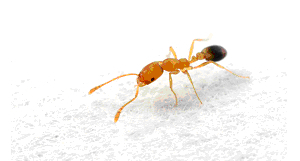 Pharaoh Ants are very small—about 1/16-inch long. They are light yellow to red with black markings on the abdomen. Pharaoh ants rely on artificial heating in buildings to survive. 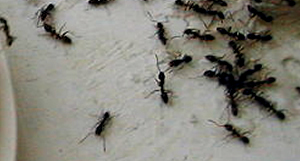 Infestations commonly occur in food service areas. Pharaoh ants can build nests in walls, cabinet voids, behind baseboards, refrigerator insulations, the hollows of curtain rods, the folds of clothes, sheets and paper and other undisturbed dark spaces. 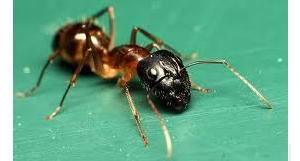 A colony of Pharaoh ants will scatter if a toxic substance disturbs it. This creates multiple problems where there had been only one. In controlling pharaoh ants, it is often advisable to seek professional help. 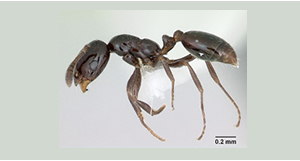 The pyramid ant is a small ant about 1/8inch (3.5 mm) in length and has one node on its pedicel. Pyramid workers are all the same size. The key identifying character is the pyramid-shaped projection on top of the thorax. The pyramid ant usually constructs its nests in soil in open, sunny, vegetation-free areas. As it excavates soil to construct galleries, the workers deposit the soil in a circular crater or mound around the entrance hole. Pyramid ants are rarely found foraging inside structures but may be common on porches, patios, and decks. Little black ants are tiny, with workers averaging about 1/16" in length; and range in color from dark brown to jet black. They are omnivorous and will eat meat, sweets, vegetables, fruits, or pretty much any other food they come across. Keeping your home meticulously clean and free of food scraps is vital to effective little black ant control. Little black ants usually live outside in rotting logs, cracks in cement, under exterior siding, in gaps around door or window frames, or in open fields, and enter homes to feast on tiny food scraps left by humans. They also occasionally nest indoors, usually in small gaps between wooden construction elements, behind woodwork, under carpets, or in gaps in masonry. Rover ants are yellow-blonde to dark brown in color, with the abdomen appearing swollen or humped at the front end. 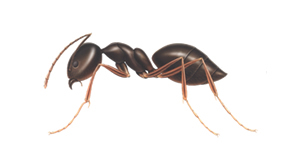 Rover ants range from 1/16-inch to 1/12-inch in length. Rover ants can often be seen running excitedly running up and down vertical objects in yards, such as blades of grass, chairs, and fence posts. Rover ants are common in woods and other natural settings, as well as around buildings. Outside, they often nest in soil or decaying wood. In buildings they prefer areas with high moisture and are often associated with bathrooms or plumbing or structural leaks. They nest in small, single-queen colonies, usually with many colonies in a single area. They feed on proteins and sweets. 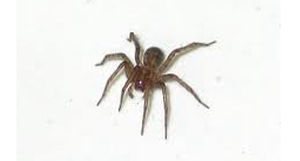 Of the many species of identified spider species, house spiders are the most frequently found in human dwelling places. Although their presence is discomforting, house spiders are not necessarily lethal to humans. Small, controlled populations can even prove useful, as they consume other unwanted household pests. House spider webs are typically funnel-shaped and can be located in various places within a home, including windows, ceiling corners and above or beneath fixtures. House spider webs are large and constructed of thin silk threads. They serve both as dwelling places and as traps for prey. A house spider's body is divided into the cephalothorax and the abdomen. They are classified as arachnids rather than insects and have eight, single-lens eyes. House spiders are brown in color and also have dark markings on its abdomen. 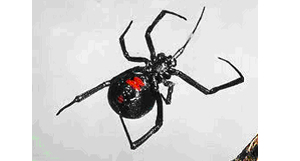 Black widows are identified by red “hourglass” markings on the underside of their abdomens. Black widows are shiny black in color. Females are larger than males and can measure up to 10 millimeters in length. Black widow spiders favor dark, secluded areas such as crevices and woodpiles. The venom of the black widow spider severely weakens the nerves and the brain, leading to impaired breathing, body aches and nausea. Death is more likely in very young or old individuals. The brown widow is generally lighter in color than the black widow. The color can range from tan to dark brown to black, with shades of grey also possible. Like the black widow, the brown widow has a prominent "hourglass" marking on the underside of the abdomen; the brown widow's hourglass, however, is usually a vivid orange or a yellowish color. The brown widow has a black-and-white "geometric" pattern on the dorsal side of its abdomen. Brown widows are often preyed on by mud daubers and sometimes by digger wasps. 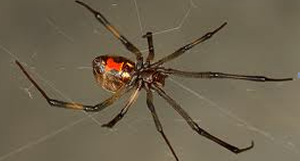 The brown widow has neurotoxic venom that is as toxic as the black widow's. 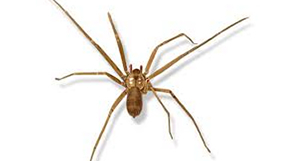 Long-legged and yellow-tan in color, brown recluse spiders of both genders are best distinguished by a fiddle-shaped pattern close to the eyes. Adults measure approximately ½-inch in length. Brown recluse spiders dwell in dark, sheltered places and can be found in homes, barns and basements, as well as outdoor habitats. Webs tend to appear disorganized and are built most commonly near ground level. The spider is a hunter, so the web is not intended to catch prey. Brown recluse spiders are shy and rarely bite unless provoked. They are incapable of biting through clothing and bites sometimes go unnoticed until effects become obvious a few hours later. A pale blister ringed in red appears first. Fever, convulsions, nausea and weakness set in within one day. If untreated, the early blister may become a lesion, resulting in necrosis and severe nerve damage. 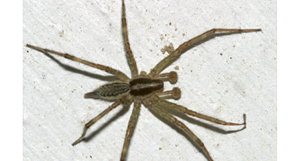 Wolf spiders are hairy arachnids that can grow up to five inches in leg span. Quick moving and relatively large in size, wolf spiders inspire fear when they are found within human dwellings. Wolf spiders are also sometimes confused for tarantulas. However, occurrences of wolf spider bites are extremely rare and are not known to be deadly. 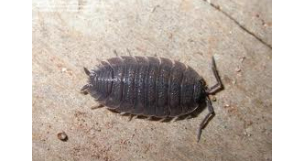 Most species are burrowers that live underground, although some specimens can be seen traveling aboveground in leaf litter, on lawns and in gardens. Most wolf spiders are also nocturnal, although some do hunt in the morning. A wolf spider's diet typically consists of insects and other small spiders. 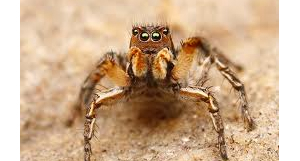 Jumping spiders tend to exhibit dull coloration, although the bodies of some males may glisten. Jumping spiders are known for their swift reflexes and leaping abilities. 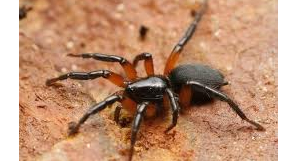 These spiders are capable of leaping as high as 25 times their own size and as such, are extremely capable predators. Jumping spiders also possess impressive eyesight. Although jumping spiders are not web-weaving arachnids, they do produce silk. Their silk is used to mark retreats and to protect eggs. Silk may also function as a dragline while jumping, allowing jumping spiders to control their fall and trace their steps. Commonly found dwelling beneath rocks, logs and other objects on the ground, ground spiders rarely leave their homes except to hunt. 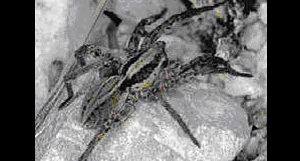 These spiders are red or gray-brown in color and may be solid or striped. Ground spiders do not cause any medical conditions in humans. Due to their reclusive nature, humans rarely see them. While these spiders do spin silk, they do not trap prey within their webs. Rather, ground spiders hunt and chase prey along the ground. Hunting typically occurs outside, but ground spiders may also be seen in homes when temperatures drop significantly. Grass spiders typically reside between the leaves of plants. Their webs can be located in hidden corners of gardens. Grass spiders are a type of funnel weaver, are common outdoors and are occasionally found indoors. They are generally brownish or grayish with light and dark stripes near the head. They have long spinnerets and are moderate-sized (3/4 inch long). Grass spiders construct a large sheet web with a funnel they use as a retreat. These webs are commonly built on the ground, around steps, window wells, foundations, and low shrubs. The American cockroach is also commonly known as the water bug, flying water bug or palmetto bug. These large cockroaches can grow to exceed 2 inches in length. They are common in shady, humid areas like flowerbeds, around trees, sewers and drains. Climate changes or food shortage can cause them to move indoors. When they move indoors, American cockroaches prefer to live in moist, humid environments. They can also survive in dry areas with sufficient food and water sources. These insects favor temperatures between 70 and 80 degrees Fahrenheit. When an American cockroach population infests a human home, the insects are drawn to food storage and preparation areas, as well as moist locations. Adult Smoky Brown Roaches are between 1-2 inches long. They are uniform brownish black to mahogany in color. Early nymphs have white stripe on back. Egg capsules are attached to surfaces. 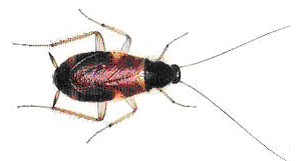 The Smoky Brown Roach prefers damp areas because they lose moisture more readily than other cockroaches. 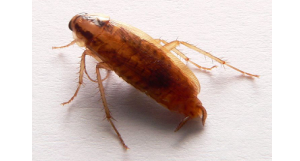 These roaches enter structures at night through cracks and crevices. 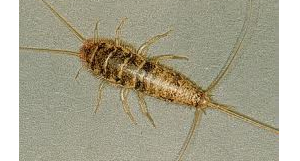 Smoky Brown Roaches live in natural conditions around structures & often can be associated with debris filled gutters. 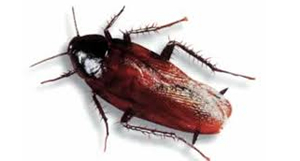 The Oriental Roach is dark brown and about one inch long. 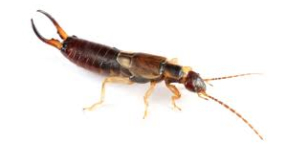 These roaches are common outdoors; often enters buildings through sewer pipes. 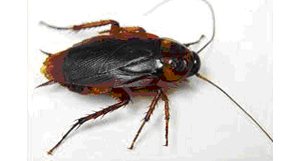 Oriental Roaches tend to live near the ground and in warm, damp areas. They eat anything, but are often found feeding on garbage, sewage and decaying organic matter. The German Roach is about 5/8-inch long. They are light to medium brown with two dark longitudinal streaks on the thorax. 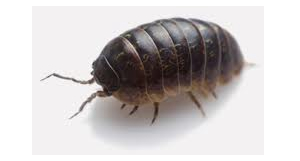 These roaches are nocturnal and primarily infest areas close to food, moisture and warmth. 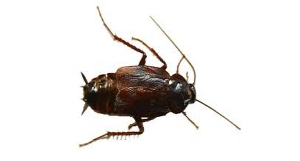 This is the most common cockroach found in and around apartments, homes, supermarkets and restaurants. The German Roach is a scavenger and will eat anything. House mice are small and slender, three to four inches long, with large ears, small eyes and pointed nose. They are usually light brown or light gray. 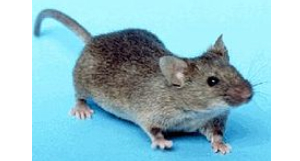 House mice droppings are rod-shaped. The house mice will nest within structures and burrows. These rodents establish a "territory" near food sources that are generally 10 to 30 feet from nest. House mice are very good climbers. House mice can squeeze through a hole that is 1/4-inch wide. This rodent is a carrier of many serious diseases. 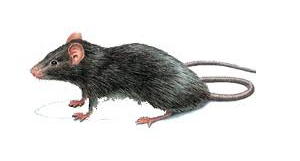 The roof rat is black or brown, seven to 10 inches long, with a long tail, large ears and eyes, and a pointed nose. Their body is smaller and sleeker than a Norway rat. A roof rat’s fur is smooth. Roof rats nest inside and under buildings, or in piles of rubbish or wood. These rodents are excellent climbers that can often be found in the upper parts of structure. They are very agile; can squeeze through openings only 1/2-inch wide. This rodent is a carrier of many serious diseases. The name centipede, which means "100 legs," can be somewhat misleading: centipedes may have anywhere from 15 to 191 pairs of legs. Centipedes always have an odd number of pairs of legs. Centipedes are elongated, with flat, segmented bodies that contain a pair of legs for all but one segment. 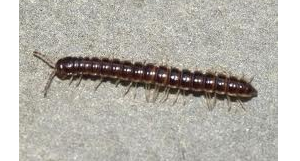 Adult centipedes are brown and measure over one inch in length. Centipedes hide in moist, dark and secluded areas during winter. 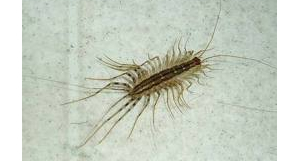 Centipedes may enter houses and buildings, but they do not roam during daytime. Scorpions have been around for a long time - over 420 million years. What makes scorpions stand out is that they can inject potent venom through their menacing tail. Scorpions are nocturnal feeders and survive on a diet of insects, spiders, centipedes and other scorpions by using their front claws (pedipalps) and stinger. It also possesses sensory hairs that are used for detecting the vibrations of a possible snack. In attack, these scorpions will grab their prey with their claws, and sting only if the victim shows signs of resistance. 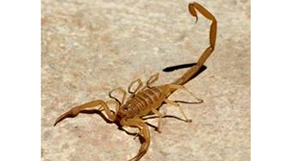 In a human victim, a scorpion's venom may cause symptoms like swelling at the site of the sting. However, some people experience numbness, and convulsions. In extreme cases, some people may experience difficulty in breathing. People who are allergic are most likely to die from a dangerous scorpion's venom. Fleas are small, wingless, and about 1/12- to 1/6-inch long. The flea is a parasite that attaches to a host. Fleas are external parasites which can be found attached to the skin of their hosts. 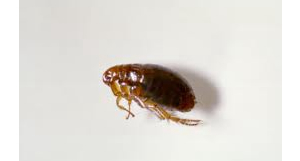 Adult fleas measure approximately 1/8-inch in length. Their bodies are shiny and reddish-brown in color. They are covered with microscopic hair and are compressed to allow for easy movement through animal fur. Fleas do not have wings, although they are capable of jumping long distances. Ticks vary in color by species. 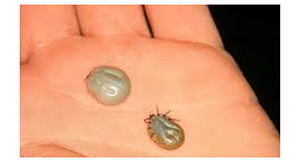 Adult ticks are smaller than a sunflower seed (1/8- to 5/8-inch long if engorged with blood), while nymphal (or immature) ticks are less than 1/16-inch. Common problem ticks include the American dog tick, deer or black legged tick and lone star tick. Ticks are often found near wooded and highly vegetated areas. Some species require moisture to survive. All females and males of most species feed on blood of mammals, birds and reptiles. Ticks not only cause irritation and discomfort, but they are also capable of transmitting serious diseases to humans and other animals.